This page links to documents related to the plant species Billardiera scandens commonly known as Apple Berry or Apple Dumpling. Billardiera scandens, as figured in A specimen of the botany of New Holland (1793), in which the species was first published. This plate has since been designated the lectotype for the species. Unsuccessful attempt to rename this species to Labillardiera scandens. 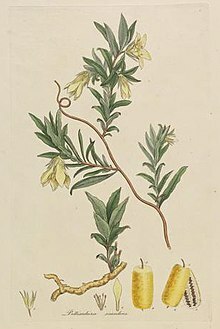 Billardiera canariensis (now a synonym of B. scandens) published, and figured in plate 15. Billardiera branchyantha (now a synonym of B. scandens) published on page 570. Billardiera brachyantha (now a synonym of B. scandens) demoted to variety rank as B. scandens var. branchyantha.